Lilith is a demonic entity that is focused on destroying relationships between men and woman. Cost includes 428 days of access after purchase date. There is a myth about Lilith that is wildly believed and is false. There is a reality about Lilith as a demon. It broadly seeks to destroy marriages but specifically targets womanhood. This demon is often found in the sternum. If you have experienced discomfort in the sternum that has no physical cause, it may be the result of this demon. Obviously, it works through the misogyny of men, but woman also can empower it unintentionally. This teaching exposes a number of open doors that Lilith uses to diminish women and damage womanhood. The Communion service is overtly a deliverance session dealing with generational and current issues that will empower Lilith. This teaching is an encounter with dignity and honor toward the heart of women with not even a hint of dishonor to men. What a gift! Such a deep well of refreshment, healing, and freedom here as Lilith is exposed and driven out and dignity and honor restored. Impossible… is what it’s seemed. But after this live stream, it’s not only possible, but exciting! Wow… off-the-charts powerful. Gender junk, around since sin, stubbornly at the core of most important issues, immeasurably damaging to all, makes the gender restoration so vital in the Mercy season seemingly hopeless. But not now. The communion portion , as usual, was deeply and widely impactful. It touched core places as only the hand of God can do. And if that were all, that would have been more than enough. But that wasn’t all. The teaching and Biblical portraits opened insights I’ve never seen – some commonly known scenes presented within the grid of gender served up explosive truths that were incredibly freeing as a woman. Amazing. But I can also see a new freedom for men, too -- inseparable, intertwined, and distinct freedom for ALL. I loved it all… especially appreciating the Genesis and Song of Songs connection, the insight on desire, the portrait of male-female pure love as bookends of this new era. Brilliant and beautiful. Not only does it give me real hope, but deep enthusiasm and… some kind of joy. It’s what we desperately need, and it’s time. And this live stream is worth digesting over time -- exquisitely transforming in this new, unavoidable day of “doing it” it so very differently. Time for the time of never being the same! Thank you, thank you, thank you for this, Arthur, and for daring to roar such truth and defiantly deal with this seemingly immense (but after this, well… NOT so much!) issue. 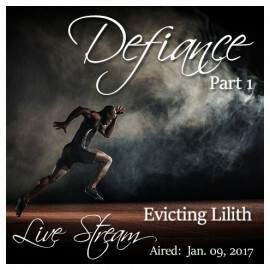 This teaching is totally eye-opening, including an education on critters, the history of Lilith and her Ponzi schemes and exposes the code that gives gender misalignment and distortions authority in our daily lives. Arthur teaches through the Word to expose how God responds and does not accept the diminishing of women and neither should we. I came away analyzing where I have been in agreement with Lilith and how the culture often down plays the subtle ways woman are diminished and pushes us to accept it as normal. The deliverance through warfare and worship was so POWERFUL. The coming together in agreement against Lilith through Holy Communion was globally transforming, the longer we pressed in together, the more authority manifested to set the Tribe free. The King showed Himself glorious! I will be listening to this again very soon and urging all, especially my sisters in the faith, to join me. This was and is continuing to be a deep deliverance for me. Arthur mentioned a few weeks ago about God wanting to deeply resource us. I feel deeply plumbed and as a result I am finding deep resources within my spirit. Hidden riches in secret places! Or hidden in plain sight! Very well done, Arthur! This one is for eternity! Make a list of your five best relationships. Now, explore the level of trust you have in each of those. Trust is the most powerful resource for producing deep relationships. Lilith will target a woman’s relationships and sow distrust with cunning maliciousness. When the seeds of mistrust sprout, the relationship becomes severely damaged.